Otto's engine of 1876 was the first successful internal combustion engine. A four-stroke horizontal engine, it used a mixture of gas and air as fuel. 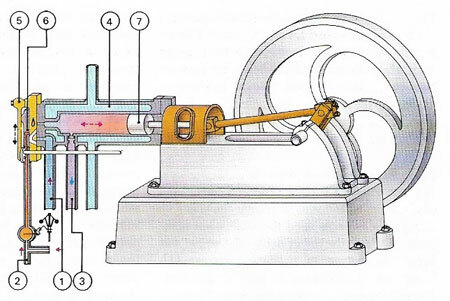 The charging stroke drew in air (1) and gas (2) through a slide valve (5) into the cylinder, pulled in by movement of the piston (7). On the return stroke, the fuel mixture was ignited by a flame carried through a narrow opening in the slide valve from a continuously burning gas jet (6) outside the engine. The expanding products of combustion produced the working stroke. On the fourth and last stroke the exhaust gases were forced out of the engine (3). A jacket of cold water (4) surrounded the cylinder and kept the engine cool. 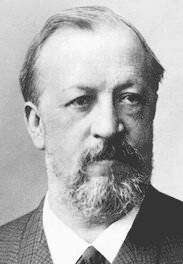 Nikolaus Otto was a German engineer. In 1861, he built a gas-fired engine which won a gold medal at the 1867 Paris Exhibition. Otto later built an internal combustion engine based on a four-stroke cycle (also called the Otto cycle). This four-stroke engine was the forerunner of most of today's engines.